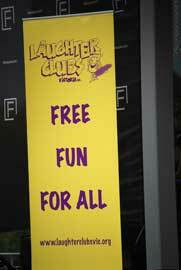 ........if you want something to laugh about then the Laughter Club is the place for you! ........or is it just 6000? The website Homepage says 7000 clubs and the About page says 6000 - someones having a laugh! They've been going 16 years though so it's not just a passing fad. ........Maybe because I was late getting there and didn't 'get' it? Find out for yourself. It's certainly worth a look just because it's so unusual. 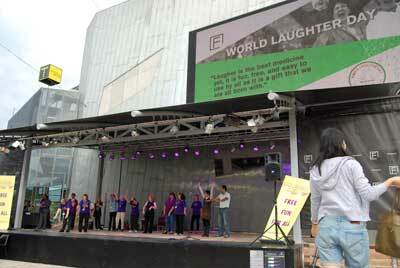 The Club I saw is in Federation Square on the first Sunday of each month at 11am. They're on the stage. I'm not sure if they still do it there in the rain though or if they move through to the Atrium. Don't be late (like I was) as it's only on for 30 minutes. 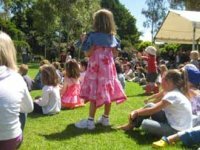 Check out Laughting Clubs for details of the other Club locations in Melbourne. There's apparently 30 in Victoria and the majority of these are in the Melbourne metropolitan area. You'll find Federation Square right next to Flinders Street Railway Station. Check out the map below - Click on the blue writing beneath the map for a better overall idea of it's location.